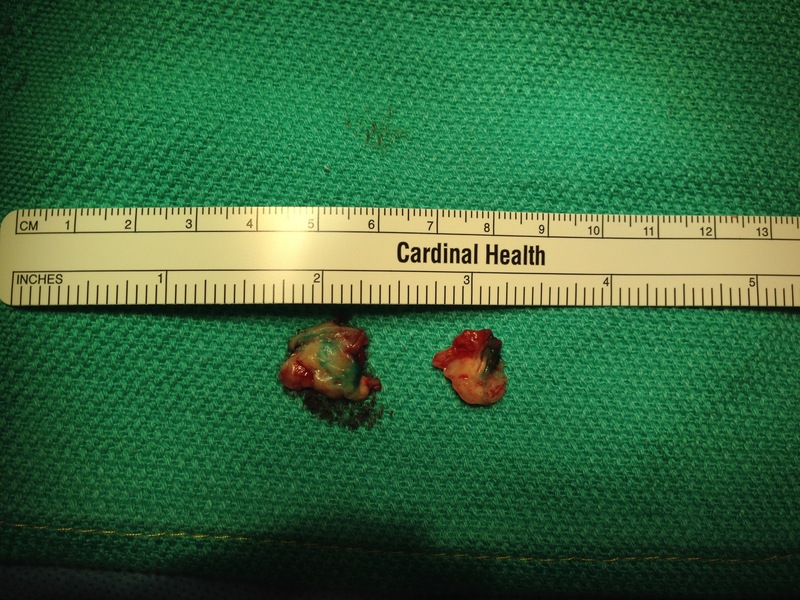 This patient had had an endoscopic saphenectomy for coronary bypass at another institution and had developed a wound infection that eventually healed, but developed a pore at the scope site that continued to drain clear fluid soaking an ABD pad hourly. 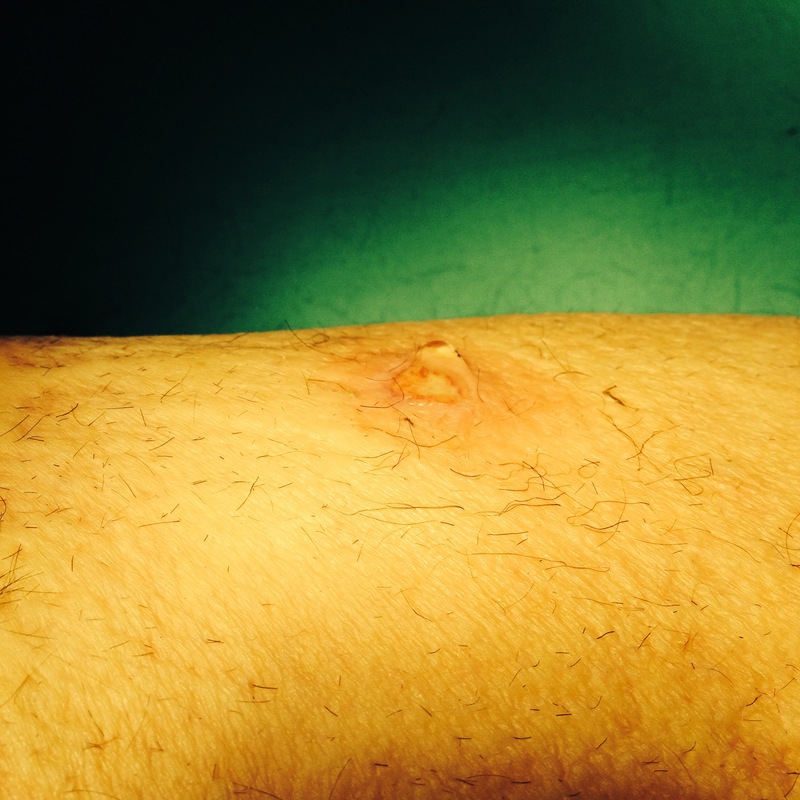 This had been cauterized and sutured without improvement. The patient was taken to the operating room for dye lymphangiography and resection of the leak. The dye used was isosulfan blue which is lipophilic and is taken up by the lymphatics from the extra cellular space and pumped centrally within minutes of injection. The lymphatics are easily visible and the leak can be resected and the source vessels can be oversewn. 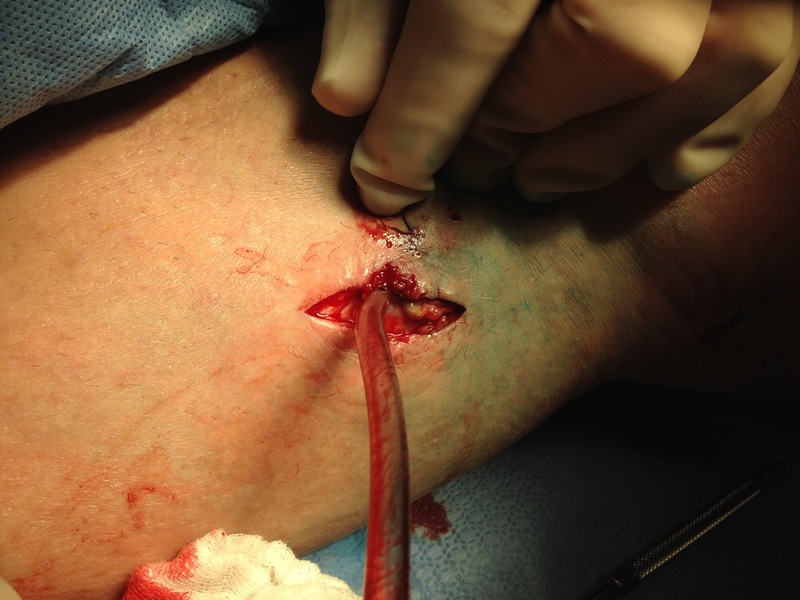 The suction cannula is on top of a lymphatic that was feeding the pore and was oversewn. 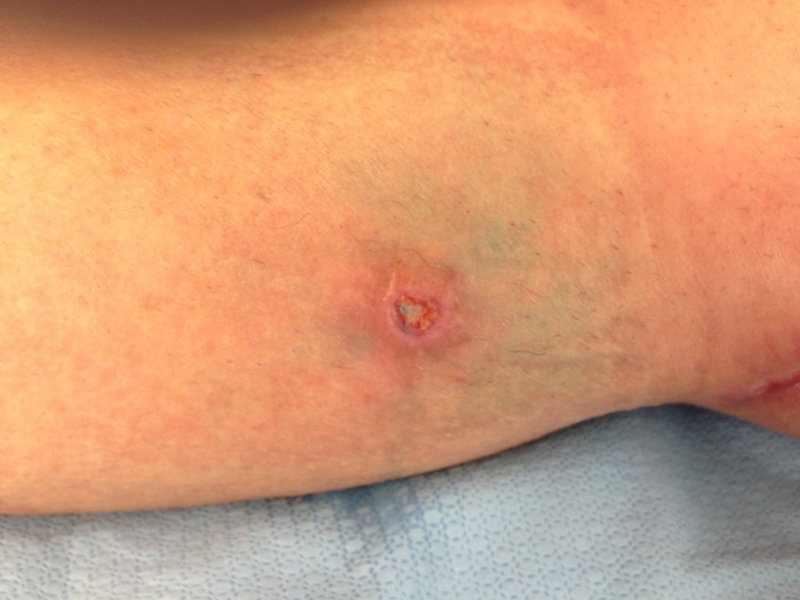 I have had this occur in the forearm as well after a braciocephalic fistula creation. The would was closed primarily. The lymphatics are evolutionarily the most primitive of our vasculature. They are gossamer threads often of single cell layer that have openings into the extracellular space and draw in fluid past bicuspid valves that bracket smooth muscle cells that periodically contract -a very primitive heart. The heart evolved from this mechanism. It’s believed that multicellular organisms gained an advantage by maintaining an inner sea that was more organized and concentrated with nutrients than the surrounding sea, and to benefit all of the cells, it was necessary to circulate this inner ocean. The extracellular space is as porous as a sponge because that is what the ECM evolved from. Holding a wet sponge up in the air and watching the water go down with gravity is what happens when you stand up -edema. It is also why you can patiently and gently massage the extravasated saline from a displaced IV out of a hand and forearm. When the lymphatics stop pumping, the protein in the fluid eventually comes out of solution forming an insoluble solid -same thing that happens in cheese making when you add acid to milk -the hardened tissues of chronic lymphedema. The pumping action is so efficient that injecting an amp of isosulfan blue into the web space between the toes subcutaneously will travel up the leg in about 5-10 minutes. There is a list of contraindications and precautions for its use, and hypersensitivity and anaphylaxis is reported to occur in up to 2 percent of patients. This patient had primary closure and stopped leaking, after suffering from nearly a year of leakage.